How can I wear jogging-pants in public? – You are probably asking yourself, why would anyone wear jogging pants in public anyways? Jogging pants are usually reserved for chilling on the sofa at home or for sweating at the gym. Although, even at the gym I prefer wearing leggings and not jogging-pants. They are just not pants I would particularly feel comfortable wearing in public. However, this changed when I came across these pants from Zara. I once had lightweight trousers with a similar cut, which I absolutely loved. Actually I still have them, but they are so worn out that I can’t wear them anymore. The waste band stretched so much over the years that they would slip of my hips and I would lose them. Because I love the cut so much I’m thinking of finding a way to make them wearable again without compromising the shape of the pants. Anyways… those jogging pants from Zara have exactly this cut. I love how baggy they are on the top, which makes them super comfy. Because they are tighter on the lower leg they don’t look like typical jogging pants. I styled them in the same way I used to style my old pants and voila, jogging pants that are totally wearable in public. Go for a great quality. The one’s I’m wearing are made out of a high quality knit material. It gives my outfit a more luxury look. Style them up with a tailored jacket that is not too baggy and a shirt. You can also wear them with a blazer. Style them with a mid- to high heel. Because these jogging-pants are made out of a high quality knit material, they also look great with sneakers. We are flying to N.Y. to visit family for a couple of days at the end of May and I know already that I will be wearing one of my new jogging-pants. I think they are just perfect for travelling in style but still being comfortable. I also bought them in a dark grey colour. Unfortunately the black ones look massive on me. I think it’s because, when black items have a looser fit, they often look bigger than the actual are. Stay tuned for another way to style those jogging-pants for wearing in public. You look so cool and relaxed in this outfit! Love the way you styled the jogging pants with the denim and pumps! Sweetie you’re awesome ! I really love of how you can makes a jog pants so chic! 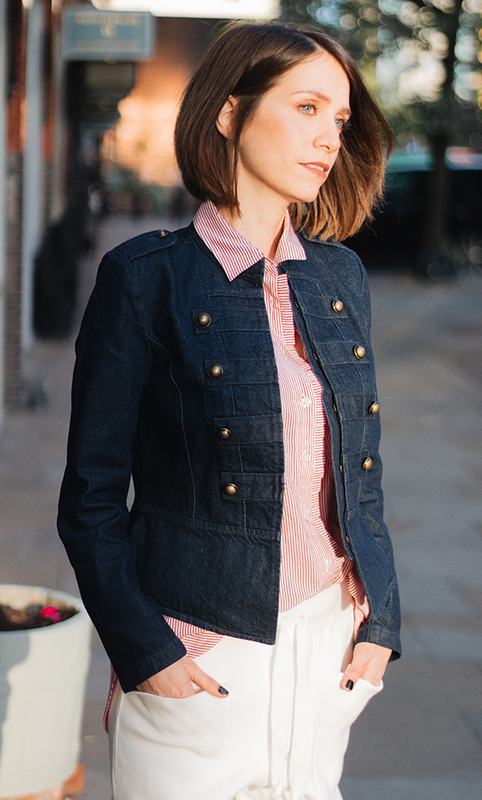 That blue jean officer jacket with hells are so perfect!